Originally published in 1977, the chapters in this volume offer a concise review of the research and new direction in the study of alcohol and cognition at the time. Each chapter has been prepared by an eminent researcher who was currently involved in investigating human cognitive behaviour. The chapters contain not just a dry summary of work done in the field, but descriptions of the impetus for the work that was done, problems in doing such work, knowledge that was gained, and suggestions for future research. Many new approaches are presented for the study of alcohol and memory, and for the understanding of results of studies already done. This was a forward-looking volume not only about directions for future research, but with solid contributions that review and integrate major areas of inquiry on the influence of alcohol on memory and behaviour at the time. Part 1: Introduction 1. 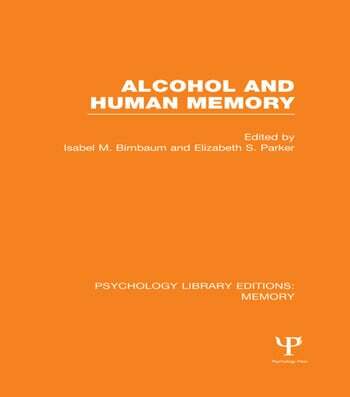 Elizabeth S. Parker and Isabel M. Birnbaum Alcohol Research: New Directions Part 2: Approaches to the Study of Alcohol and Memory 2. Fergus I.M. Craik Similarities Between the Effects of Aging and Alcohol Intoxication on Memory Performance, Construed Within a ‘Levels of Processing’ Framework 3. Thomas K. Landauer Remarks on the Detection and Analysis of Memory Deficits 4. Marcia K. Johnson What is Being Counted None the Less? 5. Harry P. Bahrick Reliability of Measurement in Investigations of Learning and Memory 6. Geoffrey Keppel and Charles R. Zubrzycki Selective Learning and Forgetting Part 3: Memory and Alcohol Intoxication 7. Isabel M. Birnbaum and Elizabeth S. Parker Acute Effects of Alcohol on Storage and Retrieval 8. Ralph S. Ryback, MD. The ‘Intoxicated’ Goldfish as a Model for Alcohol Effects on Memory in Humans 9. Ben Morgan Jones and Marilyn K. Jones Alcohol and Memory Impairment in Male and Female Social Drinkers Part 4: Alcohol and State Dependency 10. James Eric Eich State-Dependent Retrieval of Information in Human Episodic Memory 11. Herbert Weingartner and Dennis L. Murphy State-Dependent Storage and Retrieval of Experience While Intoxicated Part 5: Memory in Alcoholics and Korsakoff Patients 12. Donald W. Goodwin The Alcoholic Blackout and How to Prevent it 13. Oscar A. Parsons and George P. Prigatano Memory Functioning in Alcholics 14 Laird S. Cermak The Contribution of a ‘Processing’ Deficit to Alcoholic Korsakoff Patients Memory Disorder. Author Index. Subject Index.